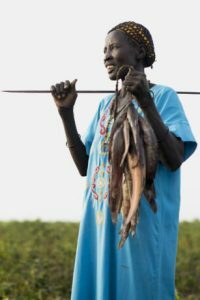 Samaritan’s Purse is training South Sudanese to farm and to fish and also providing emergency food aid to combat hunger until the new harvest comes in. Sweating profusely in the sweltering South Sudan heat, Bul Bul Akol wiped his brow and leaned on his hoe. 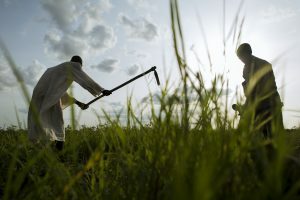 Using his crude hand tools, he had been working hard for weeks to get his 15 acres ready to plant sorghum, which is the staple of his family’s diet. 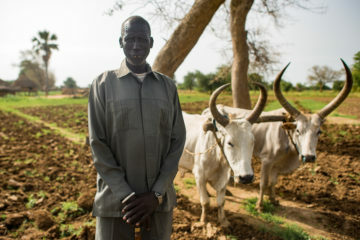 Bul Bul received a plow to help him cultivate his land. 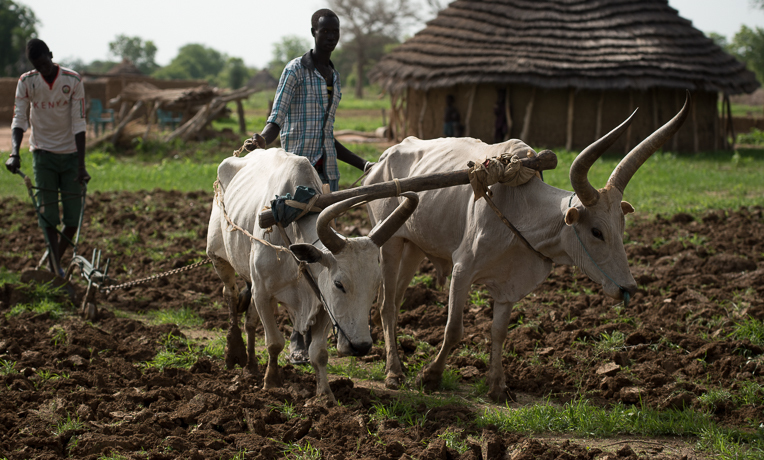 A few days later, Bul’s prayer was answered when he met a Samaritan’s Purse staff member who offered him an ox plow to help him farm his land, located outside of Aweil, a city in the northwest part of the country. “Won’t that [labor] hurt my animals?” Bul asked, referring to a misconception believed by many farmers. “If you feed them well, not at all,” our manager replied. Bul was overjoyed, and that ox plow made a huge difference! It took him only four days to plow a field that would have taken two months by hand.  “I thank Jesus for touching the hearts of Samaritan’s Purse to help me and give me what I need to farm my land,” he said. This hardworking farmer was so grateful that he didn’t want to stop plowing. “God told me that this ox plow was not only for me, but I should be a Good Samaritan to my neighbors and plow their farms too,” he said. He plowed an additional 19 acres to assist them. 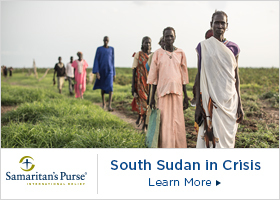 Bul is but one of hundreds of farmers that Samaritan’s Purse is assisting in the Aweil area. For him, it was a plow that increased his harvest and lightened the burdens of his family. For many others, we’re providing training in modern agronomy practices so they can increase the yield of their crops of okra, pumpkin, onions, tomatoes, sorghum, and tea. We’re teaching them how to plant and manage their crops, including the use of natural pesticides. We give each farmer a watering can while also providing them with vouchers that they can take to a trade fair. There they can choose which seeds and tools they need and purchase them with the vouchers. Samaritan’s Purse then pays the traders what those vouchers are worth. 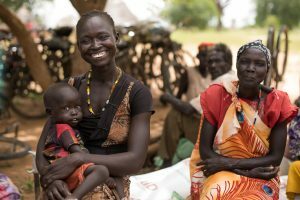 “This process helps build up the local economy and encourages not only the farmers but also the traders,” said Tim Carter, Samaritan’s Purse deputy country director for South Sudan. We’re also coming alongside local fishermen and women. Regina is one of them. Training is a big part of what we do. But we don’t just address physical needs. As God directs, we’re also meeting spiritual needs by introducing these farmers to Jesus—who often spoke the language of the farmer and the fisherman. 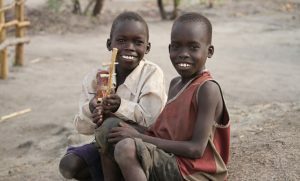 What Samaritan’s Purse is doing in northwestern South Sudan is critical. Not only are we equipping farmers for this year’s harvest, but we’re also conducting emergency food distributions to get people through the lean summer months. 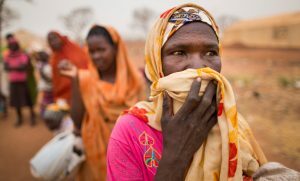 Last year’s crop shortfall has left people hungry. Rebeccah, a mother of three, is benefiting from these emergency food distributions.